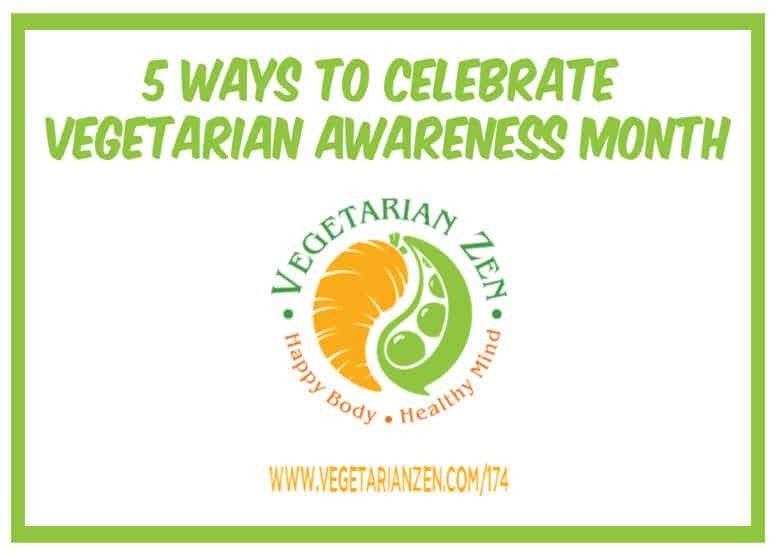 October is Vegetarian Awareness Month, so in this episode of the Vegetarian Zen podcast, we share 5 ways you can celebrate! Question: Do you make a conscious effort to do extra “vegetarian” things during Vegetarian Awareness Month? If so, what? I just listened to this podcast on the way to work this morning. I really didn’t know it was Vegetarian Awareness Month but just last Friday (October 21) I went meatless. I have been dabbling in “reducetarianism” and just made the leap to be meatless. Overtime, I plan to reduce or eliminate other animal products. Wish me luck! Happy Vegetarian Awareness month…what a great way you have found to celebrate! Congratulations on going meatless, and best of luck on your journey! If you’re on Facebook and haven’t already done so, you might like to join our closed group, the Peas and Carrots Society. There you’ll find lots of support, plus tons of great recipes and tips. Thanks for listening, and please do keep in touch with questions, episode suggestions, or just to say hi.